BOSTON, MA, May 14, 2014 – Today, Steward Health Care System (Steward) announced a new clinical affiliation with AFC Doctors Express Urgent Care (Doctors Express), the largest urgent care provider in New England. The partnership will add nine in-network urgent care centers available to Steward patients and more within the next year. When an urgent medical need arises, a patient’s PCP may not have an available appointment or be open after hours or during the weekend. Doctors Express is a convenient extension of a patient’s PCP office. Each Doctors Express location offers a full range of urgent care services for patients with common illnesses (such as the flu, strep throat, etc. ), cuts, fractures and other non life-threatening injuries. No appointments or referrals are necessary and all major insurance coverage is accepted. The average co-pay is $25 and each location is staffed by licensed board-certified or board-eligible physicians. As part of this clinical affiliation, Doctors Express physicians will now have access to Steward’s patient portal to evaluate a patient’s clinical history prior to commencing treatment. Clinical notes from a Doctors Express visit will be communicated back to a patient’s primary care physician or specialist for necessary follow up. Steward patients will remain in-network while visiting a Doctors Express location. Doctors Express has 11 locations in Massachusetts and plans to open 15 more locations in the next two years. Steward now has the largest integrated network of urgent care providers in Massachusetts with 24 affiliated urgent care locations to be opened within the next year. Through this affiliation with Doctors Express, 45 family practice, emergency medicine and internal medicine physicians employed by Doctors Express will join the Steward Health Care Network. 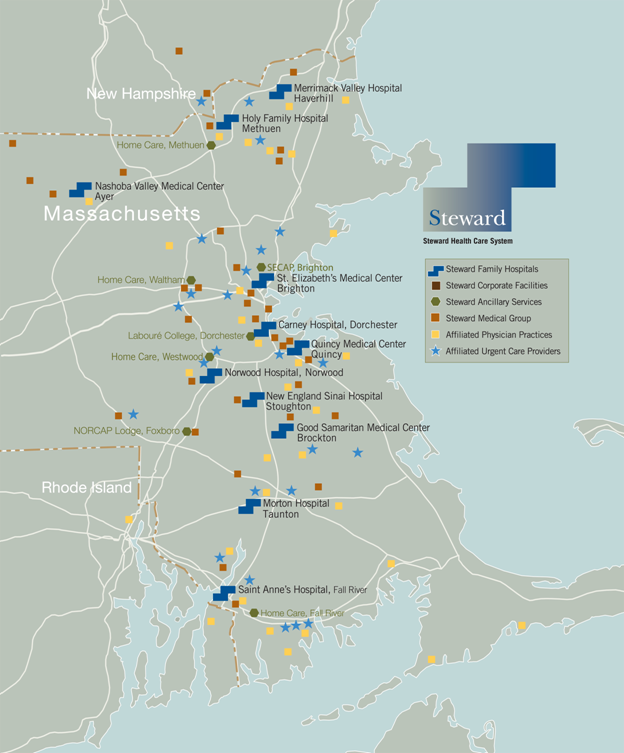 Steward Health Care is the largest fully integrated community care organization and community hospital network in New England. Headquartered in Boston, Steward is the third largest employer in MA with approximately 17,000 employees serving more than one million patients annually in more than 150 communities. Hospitals in the system include Saint Anne’s Hospital in Fall River, Holy Family Hospital in Methuen, St. Elizabeth’s Medical Center in Brighton, Norwood Hospital, Carney Hospital in Dorchester, Good Samaritan Medical Center in Brockton, Nashoba Valley Medical Center in Ayer, Merrimack Valley Hospital in Haverhill, Morton Hospital in Taunton, Quincy Medical Center and New England Sinai Hospital in Stoughton. Other Steward Health Care entities include Steward Medical Group and Steward Home Care. Further information is available at www.steward.org. Founded by an emergency room physician seeking a more efficient, affordable and convenient system for urgent care patients, Doctors Express walk-in medical centers are sweeping the country as the nation's fastest growing urgent care brand. Doctors Express provides state-of-the-art treatment for non-life threatening, highly-acute illness and injury (including minor surgical procedures) and has on-site laboratory and digital x-ray services. Pre-employment physicals, drug screening and treatment of work related injuries are also available to local employers. In 2013, American Family Care acquired Doctors Express, further expanding the reach and available services for the brand. AFC Doctors Express operates more than 140 facilities in 26 states, providing care to more than a million patients each year. Doctors Express locations in Massachusetts include: Braintree, Burlington, Dedham, Malden, Natick, North Andover, Saugus, Springfield, Waltham, Watertown and West Springfield. For more information visit http://www.doctorsexpress.com or http://www.americanfamilycare.com.